5 - Invigorating! That's the best way to describe a mostly sunny day with temps around 50 and winds from 2 - 14 mph this early in January. 8 flyers can't be wrong! This was a great way to start the 2008 flying year. And on such a fine day, another flyer dabbled on the Dark Side. 19 - Third Saturday - Waaay too cold and crummy. Hopefully February will be better. 2 - Happy Groundhog Day! If you were a groundhog and were at Frank Liske Park today, we'd be having 6 more weeks of winter. It was sunny. It was in the mid 50's. It was blowing between 3 and 6 mph. There were 9 flyers. When I left at 4 pm, there were still people flying. Good way to start the month. 9 - You gotta take it when you can get it! Winds 8 - 16; sky - sunny; temps about 60 degrees; flyers - 6; Mint Hill Park by the volleyball courts. Only casualty was Stu's kite (the spine blew up). Great day for quads but the duals were everywhere. There was a couple guys flying an old Top of the Line over in the corner but we never talked with them. I hope it's this nice next weekend. 16 - Third Saturday - As usual the winds were light and the dual line stunters ruled. But we made good contact with the Park people and it should be beneficial for all of us. 1 - First Saturday - Refreshing. That's the best word I can think of to describe today. Sunny skies, very pleasant temps and a good breeze. Although the winds varied between 2 and 12, it made for a pretty good flying day. Duals, singles and quads, 8 WACKOS and several families with kids running around flying their own kites. And some folks that weren't flying, were sitting on the side of the hill watching. Folks, we need to start bringing wind farm stuff and single line kites to the park again. The wind farm gets attention from people driving in and from the playground. They'll see us flying and come down to visit or perhaps they'll bring a kite the next time they come. So if you have older single lines that you don't fly much anymore, bring them to the park and maybe we'll find that one kid that just needs a kite to play with to get him (or her) started on the same path we follow. 15 - Third Saturday - This is Lake Park Kite Day from 10 am to 2 pm in Founders Park. We've been asked back again so bring your single line stuff and be ready to help the kids of Lake Park fly their kites. If you want to play with duals or quads bring very short lines - there isn't much room. Or better yet, save them until the field empties towards the end of the festival. You could also go back to fly after a WACKOS lunch someplace. This was probably one of two best Lake Park Kite Days since we've flown. The sky was forbidding but cleared and warmed up by noon and the winds actually came and stayed this year. There were a lot of enthusiastic families and several enthusiastic WACKOS. We flew single, dual and quad line kites the whole time and chowed down later at La Unica in Indian Trail. Stu summed it up this way, "I went on Lake Park's home page and they had plenty of pictures of our kites, including our banners. Gerhard made it on the front page of this one....go to http://www.lakeparknc.com and the pictures are on the front page. This was a good festival this year, with decent winds this time. Thanks to all who came out. It was fun!" If you looked at their publicity page for this event, they listed, "Demonstrations from WACKOS kite flying club". Somewhere, there's a photo of smiling WACKOS with their kites and banners in Founder's Park. Brian put up a few pictures, too. See Brian's webshots. Shelton Vineyards Wind & Wine Festival, Dobson, NC. Unfortunately, we got rained out Saturday and the few times when it wasn't raining the wind was non-existent. but we had a good indoor display set up and taught a lot of "little folks" how to fly little kites indoors. We even sold a few kites for Sunday's flying. A couple of us took advantage of the lack of activity to tour the vineyard and winery. After enough rain to float an ark, Sunday started with some sun but no rain and a light, variable wind. It wasn't roaring but it was enough to raise a 252 Flow form, a large Octopus, ghost delta, a Blue Moon 61/49, eddys, deltas, a roller and a handful of others. There were some dual lines and a Rev plying the light winds. But the winds were shifting and variable so steady flying was haphazard. Fortunately, our hosts at Shelton Vineyard were very understanding and are already talking about the 2009 Shelton Vineyards Wind & Wine Festival. Thanks to everyone that came to Dobson. We had a great time despite the weather. Jim Martin put some pictures up to share at his Fotki site - see Jim Martin's photo album and then check out these pictures at >> Brian's webshots <<. Crossroads Church Kites Over Cabarrus - I just heard about this event last weekend from our "new best friend at Frank Liske Park", Tina Pritchard. This is a first year event hosted by the church at the park and they would like some help. If you will be in the area for this first Saturday event at FLP and want to fly demos or help with the festival, please contact Kara McAbee at Crossroads Church; her number is at the link above. Blue Ridge Kite Festival, Salem, VA. The 10th Annual festival was a good one! Variable winds most of the day allowed for some pretty good flying. The first pics are on the net at Ninjak2k Webshots; Patrick added more at stackflyer's webshots and here are some on Grumpy's flickr page. The Saturday night slide show was a hoot! If anyone has photos, let me know and I'll put the link here. Family Fun Kite Festival, Perry Memorial Park, Aiken, SC. Anyone have news or photos? 26 - Day at the Docks, Holden Beach - John was the only one there, since he lives at Holden, but he did himself proud. Best show they've had in a couple years. click >> here << to see some of John's pictures. The Festival will be from 2 to 5 pm. It is at the Soccer Complex on the Stanly Community College campus. There are three full size fields, each on its own level. I will be setting up the kite Workshop and the DJ/commentary on the bottom field which is next to the bathrooms. Inland flying is the same everywhere and we had a lot of it this afternoon. It started out pretty good as a large Manta ray made his presence known along with a 252 with streamer tail. Several single liners, dual liners and a couple quad heads were able to get in some good flying but by late afternoon, the wind totally stopped. It was still a pretty good show for those that came to watch and there were a few kids kites in the air, too. It was great to have some music for flying. Thanks, Oliver, for having us over. Please come and fly with us at Frank Liske Park. Brian missed the Manta Ray in the air but got these shots. Click this link >> Brian's Albemarle Fly 08 << to see his web shots. Jim, however, captured the Manta Ray in the air. See Jim's Stanley County album. 17 - Third Saturday - WACKOS Spring Festival (or whatever) in conjunction with International Migratory Bird Day, Frank Liske Park. WOW! That's all I can say. This is what it looked like around 11 a.m. once the banners went up and most everyone had arrived. We haven't had a gathering of WACKOS and families this large in several years. One of our members wrote, "This has to be one of the best days I have had at the park since I began flying there in 2003. It was so beautiful, and there was such a good turn out. I wish we could see this type of weather and turn out more often.". There are a bunch of photos here in >> Eddie's Album << and more here in >> Brian's webshots <<. And yes, that is a picture of Grumpy, in Eddie's album, flying a quad and I think I see a hint of a smile on his face. Jim Martin has added a few at >> Jim's albums <<. If you have photos or video in your albums, please let me know and I'll add the links. For those of you that made it to the park, a heartfelt thanks for coming to fly and bringing friends and family. We talked to a lot of people that came to the park for Migratory Bird Day, made their own sled kites and joined us flying them. I'm sure many of them will be back to fly with us again. 24 Memorial Day weekend, Monday is Memorial Day. Third Saturday - Pops in the Park. Unfortunately, the weather didn't cooperate and there wasn't much opportunity to fly. Perhaps the next time. 5 - First Saturday - 4th of July weekend; Saturday is the 5th. Wouldn't you know it! After a week of windy days, the winds left us with a still, hot day and humidity like syrup. Smoke from charcoal grills at the park drifted lazily upwards into the heat. Strips of mylar on fiberglass rods hung limply to the ground. An occasional teaser breeze would come under the trees but it disappeared quickly. In early evening, the air is still calm and the temperatures have subsided. Not a good flying day in Piedmont Carolina. However, Grumpy & John had a great flying day at the beach on the 4th. Grumpy wrote, "The 4th started when John and Pricilla, Susan and I started setting up about 10 o'clock with 8 to 10 mph wind. It increased to 10 to 12 for most of the day and ended around 4 with the wind up to 15 to 18. We had sunshine with the temp being 86. A perfect day for flying. People coming on the beach would go to one side and leave us room to set up kites, which is a first for here. Normally we have to set anchors around and among people. Hope you had a nice 4th.". Click here to see "their show" at Holden Beach. Grumpy put more photos in his Flickr albums. Click here to go to his album. 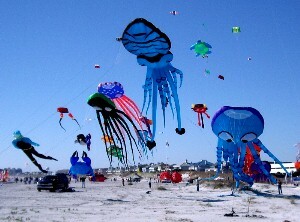 12-13 29th Wright Kite Fest, Wright Memorial, Kitty Hawk - Did anyone go? 19 Third Saturday - If it isn't too hot, let's get out and welcome Stu back from France. I don't think he did enough flying while he was gone. 2 First Saturday - Weather guessers say, "Mostly sunny. Hot with highs in the mid 90s. West winds around 5 mph. 20% chance of thunderstorms." I don't believe the wind prediction for a minute but I'll believe the temperature. Humidity is expected to start around 95% and drop to around 50% or so in the afternoon. Welcome to August in the Carolinas. I'm going to find a nice cool place and sip sweet iced tea. 30,31 Through Sept 1 - Mile High Kite Fly, Beech Mtn, NC. From the Chamber of Commerce page: August 31, 2008. A September (Labor Day weekend) favorite that offers kite enthusiasts the rare chance to fly a kite at a mile above sea level. Richmond Air Force, Wings Across Carolina Kiting and Okra Society Kiting Clubs will be showing their stuff as well. We offer kite building and decorating clinics so be sure to bring your supplies. Sunday was one of the best days we've had at the Mile High Kite Fly. Sunny and warm with decent flying even though the winds were up and down. Ultra-lights and easy flying single line kites were the order of the day although we did get a chance to get Jim's big Manta Ray in the air for a few minutes. A bunch of tired kite flyers ate their fill at the picnic Sunday night. A great finish to a great day! Eddie's placed some photo's >> here<< and Brian has some photos >> here <<. If anyone else has some photos, let me know and I'll post a link here. Monday morning, Beech Mountain was solidly in the clouds. 6 First Saturday - Wunnerful, wunnerful! Nice day: Hanna sent a few breezes our way, the skies were mostly clear and warm and we flew most of the afternoon. There weren't a lot of photos taken because we were too busy flying. But check out a few at Brian's weblog here. 20 Third Saturday - Nice. Sunny. Warm. Enough breeze to keep ultralights aloft with a little work. Early was better as the winds were up to about 8 mph but slowed down by mid-afternoon. It was a tough day for big foils and big deltas, however. For the short time some of the stuff was in the air, it was worth it. 23-27 AKA Convention, Gettysburg, Pa. See the AKA web site. 27 WACKOS At-home Fun Fly. For anyone not going to Gettysburg, let's "convene" at Frank Liske Park for a local fun fly. 28 If you can, join Mike & Judy at the Hampton Inn in Dobson (I-77, Exit 93) for a little afternoon flying near the Shelton Vineyards. About two hours from Charlotte. There's a Dairy Queen at the exit, too. 1,2 Cape Fear Kite Festival Click the link at left to go to the festival web site. It's being updated but that's the best place to get the latest info. As in years past, the festival was held in front of the Shell Island Resort. Great festival. Winds were light early Saturday but picked up for a pretty decent day. Sunday, however, was great! Click here to see some video from a local news station. Jim & Laura put a big album on kitefliers.com, click HERE. Then there's Roger's Stringy Stuff and more put up by Barry and Karen at WhataKite. Not to be outdone, Jim Martin filled his fotki page, click HERE and Grumpy uploaded to his flickr page. Check out Dave Gomberg's update page, Gomberg Kites Weekly Update. And, there are pictures on the Cape Fear Kite Festival Gallery page, too. 27-29 Thanksgiving on the Dunes in Nags Head, NC. Contact Scott Koenig, melnsct at aol dot com for details. 6 First Saturday - 2nd last club fly of 2008. Take a break from the shopping and come out and have some fun! 20 Third Saturday - Let's try and get out before everyone scatters for the holidays.